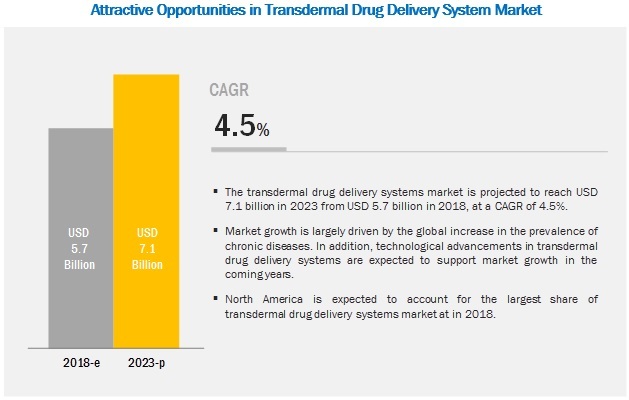 [133 Pages Report] The transdermal drug delivery systems market is expected to reach USD 7.1 billion by 2023 from an estimated USD 5.7 billion in 2018, at a CAGR of 4.5% during the forecast period. The growth of this market is primarily driven by factors such as the increase in the prevalence of chronic diseases and technological advancements in transdermal drug delivery systems. Based on applications, the market is segmented into five categories pain management, central nervous system disorders, hormonal applications, cardiovascular diseases, and other applications (smoking cessation, motion sickness, and overactive bladder treatment). In 2018, the pain management segment is expected to account for the largest share of the transdermal drug delivery systems market. The large share of this segment can be attributed to the high burden of chronic pain worldwide and the growing availability of transdermal products for pain management. On the basis of type, the transdermal drug delivery systems market is segmented into transdermal patches and transdermal semisolids. On the contrary, the transdermal patches segment is also expected to grow at a higher rate during the forecast period. This can be attributed to the benefits offered by transdermal patches such as reduced dosing frequency, improved bioavailability, reduced adverse events, and drug input termination at any point by the removal of the patch. On the basis of end users, the transdermal drug delivery systems market is segmented into home care settings and hospitals & clinics. The home care settings segment is expected to grow at a higher CAGR during the forecast period. The high growth in this segment can be attributed to the increase in self-administration of medication at home, rapid growth in the geriatric population across the globe, and the growing need for cost-effective drug administration. North America is the major revenue generating region in the transdermal drug delivery systems market. The transdermal drug delivery systems market in the region is driven by the rising prevalence of targeted diseases (such as chronic pain, central nervous system disorders, and cardiovascular diseases) in the region, the increasing use of contraceptives, and the increasing number of research activities related to transdermal drug delivery systems. The key players in the transdermal drug delivery systems market are Hisamitsu Pharmaceutical (Japan), Mylan (US), UCB (Belgium), Novartis (Switzerland), and GlaxoSmithKline (UK). Boehringer Ingelheim (Germany), Johnson & Johnson (US), Endo International (Ireland), and Purdue Pharma (US). Hisamitsu is a leading company in the field of drugs for external use. The company is a pioneer in the field of transdermal patches. The company markets its transdermal products in North America, Europe, Central & South America, Asia & Oceania, and the Middle East & Africa. The firm has constantly focused on research and development to enhance its transdermal products and launch them in the market. For instance, in 2017, the firm spent over USD 14.0 million compared to USD 12.8 million in 2016 on R&D activities. Mylan is among the leading players in the transdermal drug delivery systems market. The company strives to design, develop, and manufacture high-quality, innovative transdermal drug delivery systems, such as adhesive patches. These medicines treat a variety of conditions across several therapeutic categories. In order to strengthen its position in the market, the company significantly invests in R&D activities. In 2017, the company invested USD 783.3 million in R&D activities to innovate and launch new products in the market as compared to USD 826.8 million in 2016. The company generates its revenue primarily from the sale of oral solid dosages, injectables, transdermal patches, gels, creams, ointments, and unit dose offerings. In January 2018, Hisamitsu Pharmaceutical (Japan) launched ALLESAGA TAPE in the Japanese market. In July 2018, UCB (Belgium) received the Import Drug License (IDL) for its transdermal rotigotine patch—NEUPRO from the China Food and Drug Administration (CFDA). Emerging countries have immense opportunities for the growth of transdermal drug delivery systems market, will this scenario continue? Which product market will dominate in future? What does the future look like for transdermal drug delivery systems? What are the challenges hindering the adoption of transdermal drug delivery systems? 11.1 Hisamitsu Pharmaceutical Co., Inc.
11.11 Lead Chemicals Co., Inc.
*Details on Business Overview, Products Offered, Recent Developments, MnM View Might Not Be Captured in Case of Unlisted Companies. The study involved four major activities to estimate the current market size for transdermal drug delivery systems. Exhaustive secondary research was done to collect information about the market, peer markets, and the parent market. The next step was to validate these findings, assumptions, and sizing with industry experts across value chain through primary research. Thirdly, both top-down and bottom-up approaches were employed to estimate the complete market size. Finally, the market breakdown and data triangulation was used to estimate the market size of segments and subsegments. In the secondary research process, various secondary sources such as the International Association for the Study of Pain (IASP), International Parkinson and Movement Disorder Society, World Parkinson Congress, International Planned Parenthood Federation (IPPF), International Society of Endocrinology, International Diabetes Federation, International Council of Cardiovascular Prevention and Rehabilitation (ICCPR), European Pain Federation (EFIC), European Society of Contraception and Reproductive Health (ESC), European Society of Cardiology, European Parkinson's Disease Association (EPDA), European Association for the Study of Diabetes (EASD), Asia Pacific Council on Contraception (APCOC), Asian Pacific Society of Cardiology, ASEAN Federation of Endocrine Societies, Guttmacher Institute, National Institutes of Health (NIH), Centers for Disease Control and Prevention (CDC), United Nations Department of Economic and Social Affairs, directories, industry journals, databases, press releases, and annual reports of the companies have been used to identify and collect information useful for the study of this market. In the primary research process, various sources from both the supply and demand sides were interviewed to obtain qualitative and quantitative information for this report. The primary sources from the supply side include industry experts such as CEOs, vice presidents, marketing directors, technology and innovation directors, and related key executives from various key companies and organizations operating in the transdermal drug delivery systems market. The primary sources from the demand side include personnel from research organizations, academic institutes, and purchase managers. The key players in the industry and markets have been identified through extensive secondary research. The industry’s supply chain and market size, in terms of value, have been determined through primary and secondary research processes. After arriving at the overall market size using the market size estimation processes as explained above the market was split into several segments and subsegments. To complete the overall market engineering process and arrive at the exact statistics of each market segment and subsegment, the data triangulation and market breakdown procedures were employed, wherever applicable. The data was triangulated by studying various factors and trends from both, the demand and supply sides. Hisamitsu Pharmaceutical (Japan), Mylan (US), UCB (Belgium), Novartis (Switzerland), GlaxoSmithKline (UK), Boehringer Ingelheim (Germany), Johnson & Johnson (US), Endo International (Ireland), and Purdue Pharma (US). This research report categorizes the transdermal drug delivery systems market based on applications, type, end user, and region.